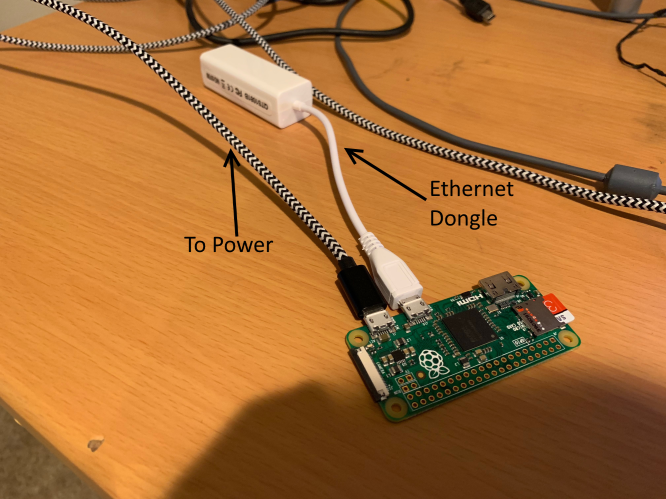 How do I attach an ethernet dongle to a Raspberry Pi Zero? I connect the Ethernet to micro USB dongle to the USB port of the Zero. I then connect a micro USB to USB dongle to the PWR port. However, I still don't see any signs that the device is on the network (I checked the list of attached devices on my router). I've tested all parts in isolation and they all work. Browse other questions tagged raspbian networking pi-zero or ask your own question. Wifi Dongle - Cannot ping beyond intranet, works with Ethernet!